Once upon a time, my good friend Adama (and yes, that's almost completely his real name) ran a Green Arrow blog entitled Dispatches From The Arrowcave. That site was one of the handful of blogs which inspired me to start this blog. Well, Real Life tends to be the bane of these superhero blogs, and Dispatches eventually fell victim to said Real Life. Well, lucky for us blog fans, another Green Arrow fan has stepped up and started a new Green Arrow blog: Aaron has launched similarly-named-but-different The ArrowCave. As a Hawkman blogger, I feel it is my responsibility to help point any time someone has a Green Arrow blog if only because without frenemies, where would we be? Tony Daniel showed off a new Savage Hawkman, someone able and very willing to use his brutal weaponry to deal with equally dangerous threats. He also said that he wanted to address niggling continuity concerns that have cropped up over the years, from reincarnation and Egyptian motifs (those are gone), to where he keeps his wings when he's not on crime-fighting duty. This is a little confusing to me: which is gone? Reincarnation or Egyptian motifs? We'll have to wait and see at this point! Summary: In Midway City, something bizarre flies through the skies -- a pterodactyl! 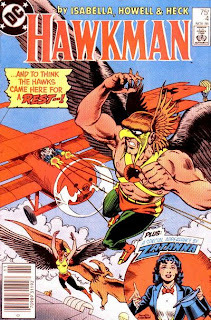 It's actually a powered glider created by Saul Ready for the Fifth Annual Festival of Flight, which Hawkman and Hawkwoman are the MCs for. Also on display will be the Golden Eagle, an ancient treasure found by Ed Dawson. While Hawkman contemplates why he has to make a speech, Zatanna pops in to visit her friends. She helps motivate Katar to make his part of the speech, and then entertains the crowd with her magic. But while this is going on, the dastardly Kite-Man makes his move to steal the Golden Eagle! Having his accomplice create a distraction, Kite-Man takes off with the Eagle. The Hawks swoop in to stop him, but Kite-Man has attached a remote control device to Saul's pterodactyl, and it is menacing the crowd! As the giant monster bird flies lower and lower to the ground, the Hawks have to let Kite-Man go in order to stop the giant glider. Kite-Man thinks he is off scott-free until Zatanna floats up to block his path. Kite-Man pulls a gun, but Zee turns the bullets into flowers, and then freezes his glider, sending him crashing to the ground. Hawkwoman is able to remove the remote control while Hawkman uses his anti-gravity belt to stop the glider safely. Meanwhile, Joe Tracy bemoans to Coral that the Hawks do not deserve their accolades, when suddenly the pair is joined by the father of Mavis Trent, who vows to avenge his daughter! Review: Well this is definitely a change of pace. From The Beatles reference title to the Superman tease opening to the fact that the villain is Kite-Man, this issue is like a bowl of sorbet after the main course that was the Shadow War and the opening story of this series. The inclusion of Zatanna (itself a reference to her appearance in Hawkman v.1:no.4, which is given a footnote) and the general Silver Age-y-ness of the story just adds to the weirdness. The cover is even a Silver Age turn, with Murphy Anderson lending a hand. It's not all goofy fun, though, as we do get the introduction of Mr. Trent, who shall no doubt be a thorn in the side of the Hawks. Overall though I liked this issue. It was a light throwback to an earlier age and acted as a nice break from the normally heavier subject matter in this series. Image: Hawkman v.2:no.4, 1986, Richard Howell & Murphy Anderson. This is the last week before the "New 52" Universe starts, so we have a few more loose ends to tie up before move into the new timeline. 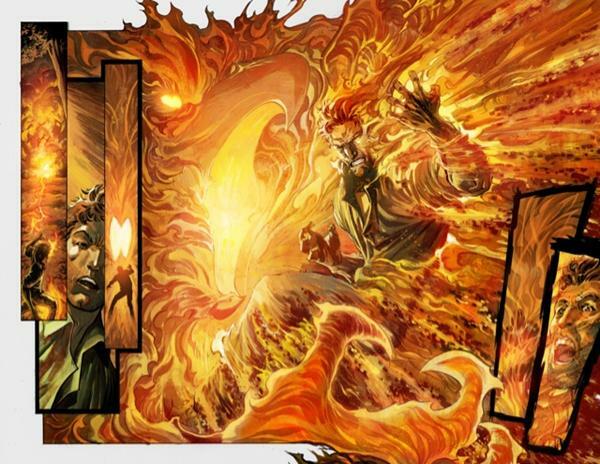 Brightest Day Aftermath: The Search For Swamp Thing #3 -- Has anyone been reading this? Is Hawkman involved? The cover swaps have confused me and gotten me all mixed up. Flashpoint: Lois Lane and The Resistance #3 -- Hawkgirl might pop up in this issue, but if she does I imagine it won't be much of an appearance. Looks like pretty slim pickings, and as far as Hawk-related stuff it will be slim pickings until the end of next month! But, hey, it's an ongoing Hawkman book so I am willing to wait. Thanks to Newsarama, we have our first peak at Philip Tan's interior art for The Savage Hawkman! Definitely in line with his style which I was very fond of on Outsiders! There's a second image, which is somewhat more mundane, which can be seen here. Image: Savage Hawkman #1 interior art, 2011, Philip Tan. As revealed on Newsarama last night, we now have a logo for The Savage Hawkman. 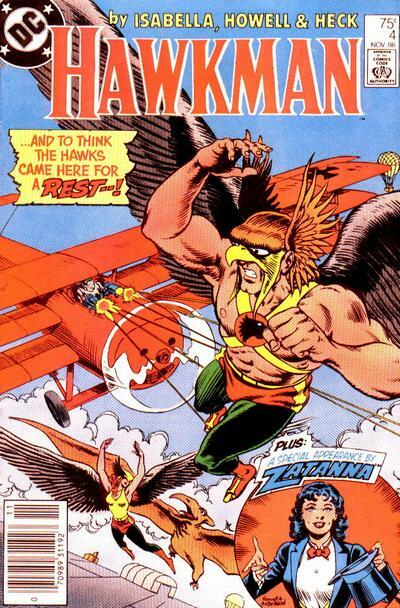 Certainly a major departure from any previous Hawkman logo! The font in general is impactful, and incorporates the Hawk sigil which was used on Volume 4. It has a sort of art deco vibe in some of the curvatures as well. Overall, I like it. I wonder if the red color will change or stay constant? Image: Savage Hawkman Logo, 2011, Image retrieved from Newsarama. Okay, you can assign the blame for this one Frank over at the Idol-Head, but I guess what's good for the Martian is good for the Thanagarian (or what-have-you). Although, considering that one of my biggest traffic drivers are the folks over at the Shirtless Superheroes blog (*waves! *), I guess this is audience appropriate! Image: "Pleasure Chests" Hawkman, "Christian A.," 2011, image retrieved from Comic Art Fans. DC has released :30 second and 2:00 minute commercials for the upcoming "New 52" initiative (which I am going to be using in place of the groan-worthy "DCnU" (ugh) here and elsewhere). The two commercials hype the upcoming relaunch of the line and give special attention to the "Big Three" plus Green Lantern. But lesser characters make the cut too, especially in the longer one. You can see the spots over at the Hero Complex blog of the Los Angeles Times. The short spot is going to air like a movie trailer in theaters. Pretty nifty little bit of advertising in my opinion, but I want to see it on Prime Time, too! 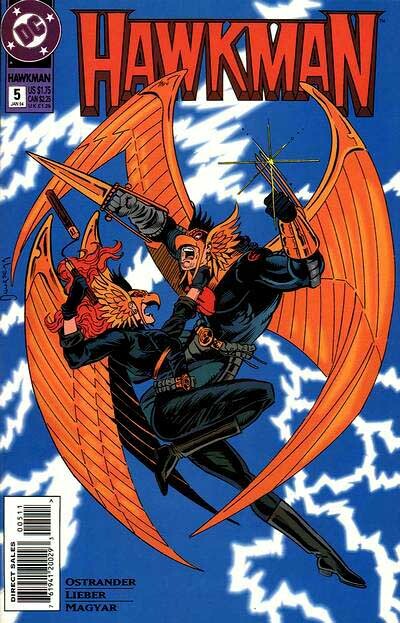 No internal artwork of Hawkman, but the cover to Savage Hawkman #1 does appear in both spots. With the reboot looming, these lists get pretty thin each week. Come to think of it, I imagine that for a while these lists will be pretty thin after the reboot, since I doubt Hawkman will be an in-demand guest star, and evidently will be playing only a minor role in Justice League. I may need to rethink this post. Flashpoint: Wonder Woman And The Furies #3 -- As one of the titular Furies, Hawkgirl has a chance of appearing in this series. Still no interest in this title, or any of the Flashpoint books for that matter. I'm looking forward to the "New 52" if only because it means no more shipping lists bulging with Flashpoint books. 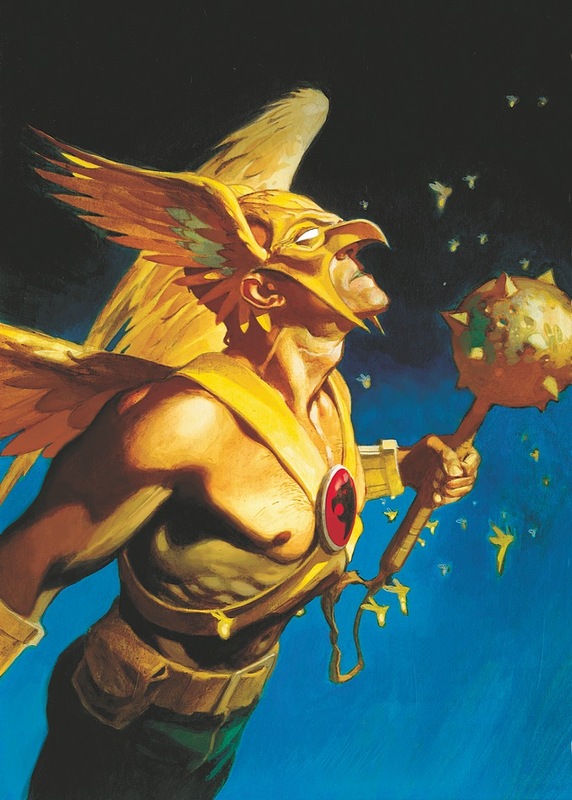 Geoff Johns's complete, acclaimed run on HAWKMAN, from issues #1-25, are collected in hardcover for the first time, along with JSA #56-58 and HAWKMAN SECRET FILES! These stories, also featuring the talents of James Robinson, Rags Morales, Patrick Gleason and many others, reintroduced Hawkman into the DCU as he tries to reunite with Hawkgirl. But with no memory of their past lives together, Kendra wants nothing to do with Hawkman – that is, until she learns that the deaths of her parents years ago were actually murders, and she is forced to enlist Hawkman's help in unlocking the mystery and finding their killer! While it pleases me greatly to see DC have enough faith in Hawkman to give him an oversized hardcover, I have to pass on this one since I already own all of the issues collected here, most of them already in softcover collections. Only the first two arcs (#1-4 and #5-6) do I have in single issues. So while I am tempted to buy it just to have it on the shelf, right now I am going to have to pass because frankly that is a bit rich for my blood (and my budget). Anyone else suspect that this release is at least partially due to the Flash by Geoff Johns Omnibus? Image: Hawkman by Geoff Johns Omnibus, 2011, Andrew Robinson. defeat Morphicius before he becomes unstoppable. Still hard to figure out exactly who or what Morphicus is from these covers, but that's the point so I am cool with that. Notice, however, the elements of Hawkgirl's helmet on Morphicus. A Thanagarian connection perhaps? Also, notice as well that Hawkman seems to be wielding a katar and claw weapon combination, much like he did in Volume 3. Still totally digging on Tan's artwork. The chin of Hawkman's helmet may take some getting used to, but the harness and wings look excellent. The first issue of The Savage Hawkman is scheduled to hit shops on September 28th; #3 is due in November. 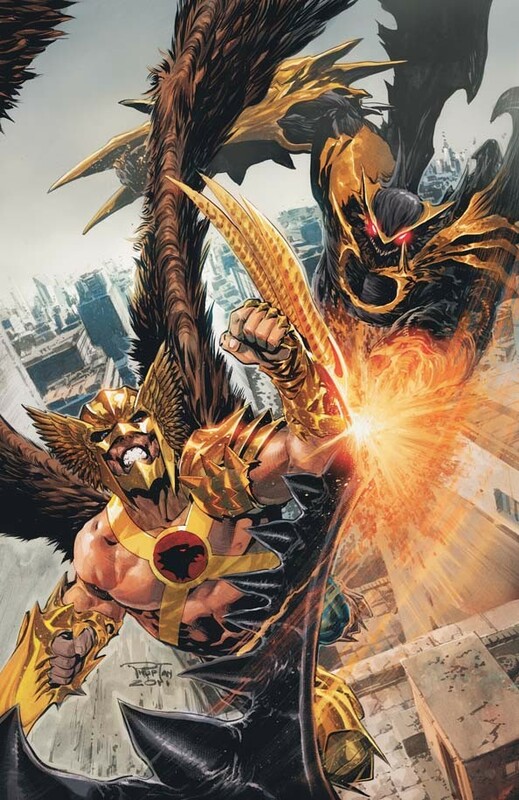 Image: The Savage Hawkman #3, 2011, Philip Tan. Well folks, once again there is nothing on the DC list of new releases this week which relate to Hawkman and Hawkgirl. And frankly, looking over the list, there's nothing on here which I am even buying. Maybe there's something to this reboot after all. Not that the lack of buying interest is entirely bad mind you. I am sure my bank account is happy about it. I tend to go on spurts where something captures my interest and I buy a lot of stuff relating to it. So shutting down my over-active enthusiasm is healthy for me. One reason I like blogging (and podcasting) is that they are both extremely cheap, financially speaking. I get a good ROI on them because I (generally) enjoy creating them and I don't pay anything to do it. The fact of the matter is that the longer I spend in this hobby and involved with the online fan presence of this hobby, the less in common I have with my fellow hobbyists. Again, it doesn't matter. The impetus is on me to get what pleasure and enjoyment I will out of this hobby and let others do the same. I'm really pontificating lately, huh? This adorable little cartoon is drawn by "jbrant047," and you can check out their work over on DeviantArt. Image: Heads Up JSA, ??? ?, "jbrant047," image retrieved from DeviantArt. NEW: The release schedule for The New 52 appears set at 13 titles per week on a four week month. What are DC's release plans for months with five Wednesdays? Our plan for five week months is to maintain The New 52 at 13 titles per week for each of the first four weeks of the month, and schedule some of our other DC Comics and Vertigo titles in the fifth week. Our goal is to have each of The New 52 go on sale the same week of the month each and every month. I like this approach in theory. 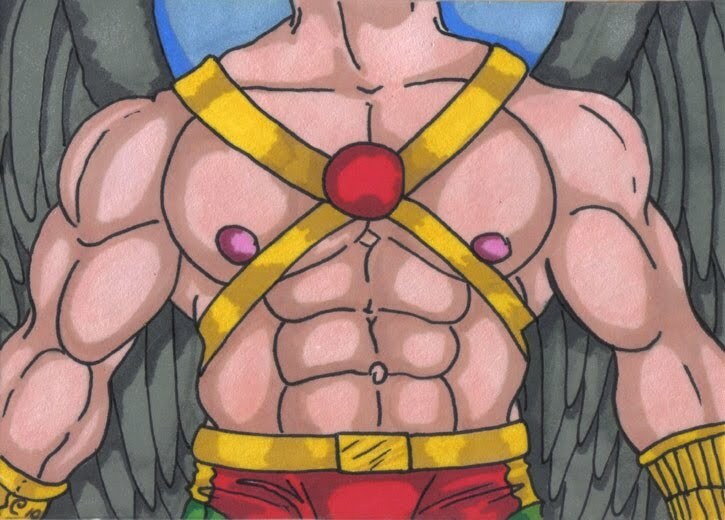 For instance, Savage Hawkman right now is scheduled for week #4 in September and October. So at the end of each month I know that Hawkman will be on the shelves. Readers who buy their comics weekly know about what to expect each time they go to the shop. All well and good. Do I think they will be able to keep this schedule? No Hawkman or Hawkgirl stuff seems to be coming out this week, folks! We're in the final straightaway before the debut of Savage Hawkman at the end of next month, and I find myself in a weird position with DC Comics. I just got my box from DCBS (if you want to mail order your comics, these guys are a great choice for both price and service), and the only DC Comics books in there were the DC Retroactives of Flash and Wonder Woman for The 70s, Action Comics, and Tiny Titans. And of those four books, two of them are one-shots and one of them is a book I am getting for one story arc (Reign of the Doomsdays). So while the comics world is gearing up for the "DCnU" (ugh), it seems that my vestment in DC Comics is at a very low point. This evident lack of interest carries forth when I examine the list of DC titles I am picking up in September. Only 5 titles total of the new ones interest me enough to actually buy them, and 40% of them are non-superhero titles which, let's face it, are going to be treading some rough terrain to be on the schedule this time next year. (It seems to this blogger that DC is trying to cash in on some of the success which IDW is having with their GI Joe titles; I applaud this approach and hope that they can get some crossover readers.) And of the three superhero books, one of them is for a character who has been primarily defined by how unrelatable he is, one of them is still spinning his proverbial wheels dating back to before Infinite Crisis, and the last set is a concept which has never sustained an ongoing series for any real length of time. So while I am excited for these titles, its very clear that my main feeling for the balance (a better term would be "large majority") of the new titles and creative teams is ambivalence. So while I appreciate that DC is going in a fairly drastic direction and restarting the universe (sort of), it seems that I am even more out of touch with what they are peddling than ever before. This is a feeling I have had with Marvel dating back to Avengers: Disassembled, it now it seems that I can mark this point for DC's passage into that territory. If this new initiative is to be successful, then DC needs to reach out to the market which is energized and excited by these new titles and teams. They need to tap into existing readers and get them to try something new. They need to find those always elusive "new readers" and lure them in with digital downloads and Jim Lee costume designs. And of course, they need to deliver to those readers, old and new, strong and compelling stories which have been the cornerstone of DC Comics for as long as I have been reading them. They should not, and frankly, cannot worry about guys like me. Myself and readers like me are not going to make or break this effort. We've crossed the proverbial Rubicon, and our prime days of comic book fandom are on the decline. Doesn't mean I don't love comics or that I won't be buying them. But I -- and those like me -- can't be the target if you really want to develop and grow the market and make money. Ultimately, if DC gives me stories with the characters I like which are exciting and fun, then I will be happy. But they really need to go capture others besides the dyed-in-the-wool set, and I for one hope they suceed with flying colors. Oh, and that Hawkgirl shows up at some point. That would rock. Title: "A Rage Of Hawks"
Summary: Katar (in Shayera's body) is flying Shayera (in an old man's body) back to his loft. Old Man Shayera tells Katar about how Count Viper came to possess her body, while Katar tells her about how he was saved from the cataclysmic battle (which ended Hawkworld) by Carter Hall. After getting the intelligence they need from Dr. 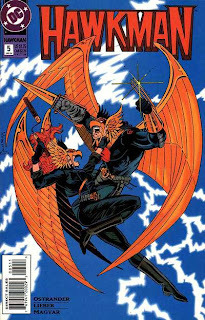 Moon, Old Man Shayera dresses in a Wingman's uniform and the Hawks set out to stop Viper. Review: This issue serves the primary purpose of catching the reader up on how Shayera's body was taken over by Count Viper as well as bridging the gap between the end of Hawkworld and the start of this volume. From there, it's fight, fight, fight! And its a pretty solid fight as well, with Viper controlling two of the more powerful JLAers but struggling against Wonder Woman's will the entire time. Steve Lieber does a good approximation of Duursema on the pencils, including a very nice panel of Diana breaking free of Viper's control as well as an amusing shot of Old Man Shayera wearing a Wingman's uniform. Nice little adventure but between the flashbacks and the cliffhanger, is definitely part of the larger story. Image: Hawkman v.3:no.5, 1994, Jan Duursema.